Published: Sept. 8, 2017 at 05:09 p.m. Updated: Sept. 8, 2017 at 06:26 p.m. The night was dark and full of terrors. But now the autumn sunlight gently falls upon us. The regular season is finally here. We have persisted. We have waded through the barren wasteland of spring and summer with merely the hint of footballishness from which we sucked the marrow as sustenance. Alas, now we feast on the weekly delights of bona fide gridiron action and all the trials, travails and triumphs that come with it. Sit, dear reader, sit and consume until you've had your fill. Then consume more. For today, we set lineups. Tomorrow, we die. This is the Stock Watch. Look on his ankle, ye Mighty and despair! That might be a tad dramatic but the situation with OBJ isn't looking particularly encouraging. The receiver wants to play in Big Blue's Sunday night opener. Not a surprise. The question remains whether the inflicted ankle will comply. Stay tuned, dear reader! The answer is still to come. Hopefully it doesn't come too late. On the upside ... there are TWO Monday night games, increasing the pool for free agent receivers, should the need arise. It's all the rage to try and pick the rookie tight end that will shake the narrative bonds of first-year futility. This year, our new torchbearer is Evan Engram. While the athletic pass-catcher is No. 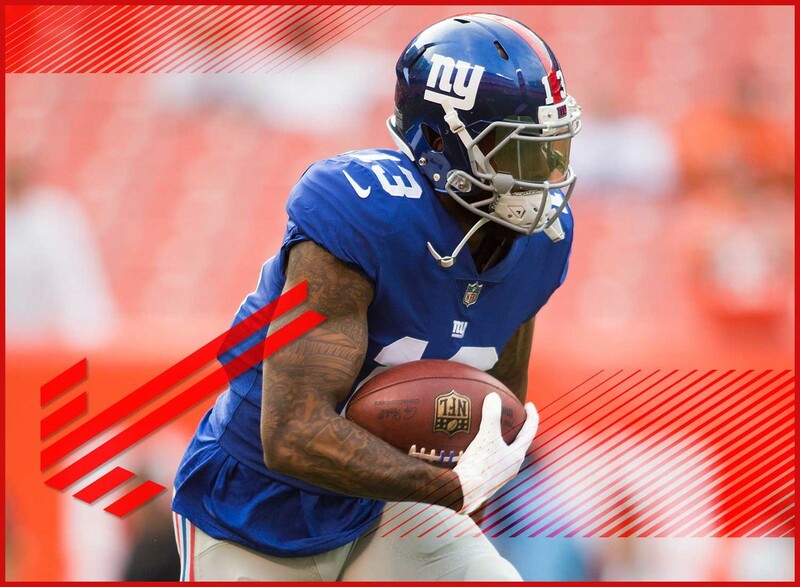 2 on the Giants tight end depth chart, there's chatter that he could be on the field for as much as 60 percent of the offensive action. In the past, Eli Manning has not been afraid to use his tight ends, especially in the red zone. Why else would we have learned the names of Larry Donnell and Will Tye? Engram could be the next to etch his name on this list. In the event OBJ can't fulfill his duties, maybe a couple more targets go Engram's way? Impossible is nothing. Remember Jonathan Stewart? Good ol', "been here plugging away since 2008, being a fairly consistent RB2 while dealing with guys always trying to take my job" Jonathan Stewart. While the fantasy community has been making eyes at Christian McCaffrey all summer long, Stewart still has a lock on the goal line carries. Or so we are to believe. For now, I'm believing. For this to work, Cam Newton will have to give up his role as the team's best goal line back. Will the lion stifle his roar and let another member of the pride help? We could learn a lot this week against San Francisco. Having feet is a useful (though perhaps not necessary?) condition for being a running back in the National Football League. So, when you don't find Leonard Fournette's name on the injury report after his slew of preseason podiatric problems, you can surmise that he has not one, but two healthy feet. And that's cause to celebrate. You know what's not cause to celebrate? The Houston Texans defensive front. But it's reassuring to know that Fournette will be at full strength when he charges toward the rampaging horde on Sunday. It seems as though the Good Health Fairy has not brightened Thomas Rawls' doorstep. Or maybe it has? Not all that long ago, he was questionable with a high ankle sprain. Next thing you know, he's a full participant in practice and seemingly a go for Sunday against the Packers. Everything surrounding this backfield is about as see-through as an Ethiopian dark roast blend. This has been your daily reminder that the Seahawks backfield is destined to drive you mad before the season ends. The good news is that John Brown says he's ready to go for Week 1 in the wake of a persistent quad injury. It seems the Cardinals agree. The bad news is that he's stuck behind Jaron Brown on the depth chart this week. The Lions secondary presents a potentially tasty morsel ... but only if you can get several bites at it. Volume may be a problem for John Brown this week and that could be a problem for you. Perhaps I could have looked at this in a glass half full way and said "Hey! Corey Davis is on track to play despite the hamstring injury that bothered him all preseason." But I didn't. Instead, I look at it as Corey Davis being on a pitch count (the coaches say it isn't a pitch count. But it's a pitch count.) and feel a twinge of disappointment. Sometimes you want barbecue chips but all they have is plain. It's better than nothing, but not what you'd hoped for. That's how I feel about Corey Davis right now. Loneliness is being a non-pass-catching running back on a team that chucks the football with reckless abandon. But if you're to believe what's coming off the wire in Baltimore, then Terrance West will be able to soon resign his membership among Friends of the Friendless. With Greg Roman in Charm City to help organize the offense, there's a chance the Ravens will run the ball more. Of course, 49er (and Ravens) fans remember Roman as the man who abandoned the run for three straight failed passes in the Super Bowl. But people can change, right? I was once denied an interview with a football player who said he needed to visit the training room to get a shot in his groin. I didn't argue with him. That player was not Cooper Kupp. But it could have been. Which is why you should have a minor case of the sadz that Cooper Kupp's balky groin has him slotted behind Robert Woods on the depth chart this week. If Kupp can get on the field in this contest, he has nice WR3/4 appeal as a player who should see plenty of targets. Trying to predict Ameer Abdullah's fantasy prospects in 2017 has given me a heapin' helpin' of "meh". He offered middling production as a rookie then missed nearly his entire second season with injury. Abdullah plays in an offense that treats its running backs like that last slice of pizza -- the one that's small and kind of weird shaped with just two smallish pieces of pepperoni on it. That second piece is Theo Riddick, who could end up on the field at the same time as Abdullah a lot this season. You go ahead and grab that last slice. I'll get something else.